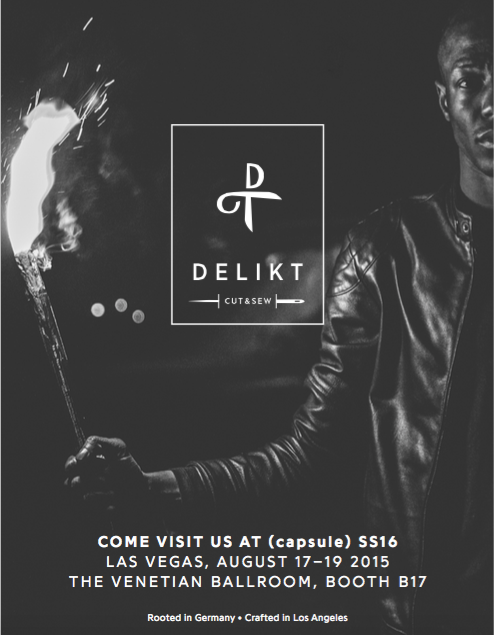 LA-based brand DELIKT is showing for the first time at (capsule) SS16 Las Vegas, August 17-19, 2015, at the Venetian Ballroom, Booth No. 17, 3355 S Las Vegas Blvd. The brand’s classic collection builds the foundation of DELIKT and will be available for wholesale for the first time. All DELIKT products are designed and crafted in Downtown Los Angeles with only the highest quality materials, including leathers such as soft lamb nappa from Italy and California milled Supima® Cotton dyed with low-impact eco dyes. These materials are used for all of DELIKT’s jersey styles, reflecting the personal and sustainable background of the designers. Highlights include the “Fight or Flight” Pants, inspired by martial arts uniforms, and the bomber jacket. Lightweight, comfortable and sleek, these pants have a relaxed fit and drawstrings paired with supreme quality twill fabric and tailored cuts. DELIKT’s take on the bomber jacket is complemented with a version made of smooth and thin glove suede lamb leather for a sophisticated yet bold look. gangsters” like Les Apaches, a Parisian street gang from the belle epoch, and the German Ringvereine. Both very sleek and well dressed on the outside, but somewhat dark and tough on the inside. “I like the idea of secret societies and taking matters into their own hands while following a strict codex to only do good”, says founder and designer Daniel Thies. DELIKT is available in the U.S. via DELIKT-CLOTHING.COM. Prices range from $85 to $1595. DELIKT, founded by Daniel Thies and Eva Napp in 2015, strives to fill the void in the market of contemporary leather garments with minimalist designs and skillfully made clothes. Designed and made in Downtown LA - a neighborhood renowned for its tailoring since the 1920s. DELIKT embraces the culture of a modern-day “Wild One” Marlon Brando-era. Thies and Napp design for men who want statement outerwear that can transition from day to night with a change of a shirt or jeans. Learn more about DELIKT premium leather here on the Fashion Blog.